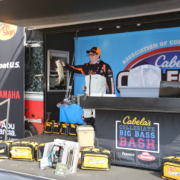 The scales are closed, results are in, and prizes have been handed out here in Paris, TN on day 1 of the 2018 Cabela’s Collegiate Big Bass Bash presented by Berkley. Nearly 500 of the top collegiate anglers took to Kentucky Lake in search of some healthy pre-spawn bass. The total amount of prizes up for grabs this weekend are worth $35,000. Top 10 finishers in each of the eight sessions today and tomorrow will win a variety of those prizes. Action started early this morning as anglers got to work quickly catching these Kentucky Lake bass. 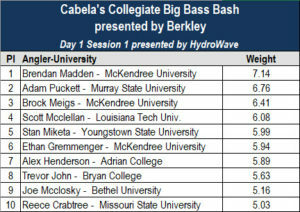 Brendan Madden from McKendree University finished at the top of the pack when scales closed for session one. Madden’s 7.14 lb largemouth bested the second place fish in this session by nearly half a pound. As anglers made their way across the weigh-in stage during this first session, it became very evident how a majority of the field were catching their fish. Reaction baits were the key. Crankbaits, lipless crankbaits, and spinnerbaits were all popular baits mentioned by the anglers. Following the conclusion of the first session at 9:00 am, session 2 began immediately. Numerous anglers who waited to see how session 1 panned out, and decided not to way their fish, promptly weighed in during session 2 to set the bar early. 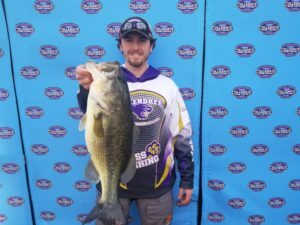 Lucas Murphy of Grand Valley State won session 2 with a largemouth bass weighing 7.27 pounds. The competition in this round was stacked closely together. The weight differential between 1st and 10th place was less than two pounds. It took 5.47 lbs to claim 10th place. A common theme began to develop early on in the day. In every weigh-in session throughout the first day of competition, it took at least 5 lbs to finish in the top 10. We projected through the week that Kentucky Lake would show out this week, and that 4-5 pound fish would be common. Halfway through day 1, this held true. Moving to session 3, the action started off at a furious pace. Ty Cox of Blue Mountain College was one of the first anglers to make it to the tanks. His fish weighing 8.94 lbs claimed the early lead, but it remained to be seen if it would hold up for the remaining hour and a half. Session 3 saw a total of 71 fish visit the scales. As was the common theme on the day, Kentucky Lake flexed its muscle as one of the best bass lakes in the country. All 10 fish to earn prizes in session 3 weighed over 5.50 lbs. 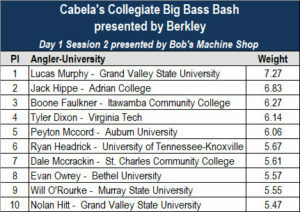 Once the lines closed and scales cleared, Ty Cox of Blue Mountain College sat atop of the session 3 leaderboard. 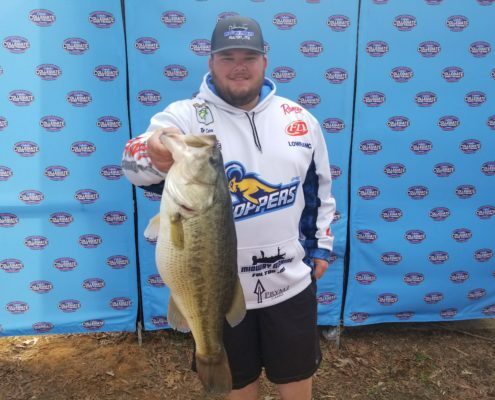 Not only did this fish earn him top prize in session 3, it also placed him at the top of the pack with the overall big bass for the event thus far. Historically, session 4, the final weigh-in session of the day, sees the most number of fish cross the scales, as well as the greatest number of quality fish. 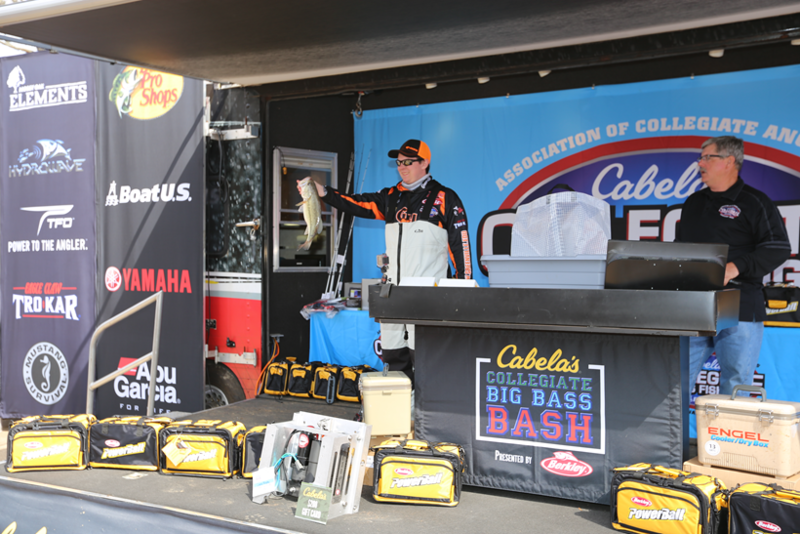 During the early weigh-in sessions, many anglers will visit the stage to take a look at what is leading for that hour. If the fish they have won’t take top prize or place very high, then they will return to fishing and weigh-in later in the day. By the end of the day, they still have not weighed in their fish and have no choice but to bring it to the scales. The same held true this year as 108 fish were weighed in during the fourth and final session. 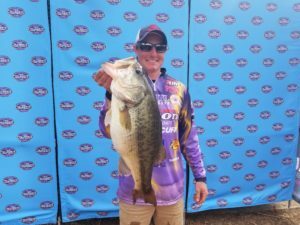 Continuing the trend we mentioned earlier, it took no less than a 5 pound class fish to place in the top 10 of session 4 presented by Garmin. 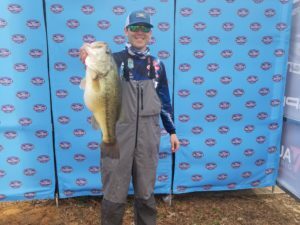 Chet Reaves from Auburn University claimed the 10th spot with 5.77 lbs. All of the suspense leading up to the final weigh-in of the day culminated with Brian Pahl’s 9.22 pound fish. 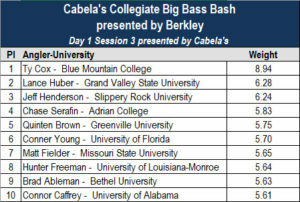 The Bethel University angler rocketed to the top of the leaderboard, while at the same time taking hold of the position of overall leader for the 2018 Cabela’s Collegiate Big Bass Bash – presented by Berkley. 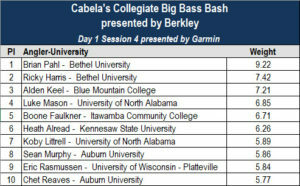 Pahl’s fellow Bethel University teammate Ricky Harris took second place in session 4 with a fish weighing in at 7.42 lbs. All week, the main storyline revolved around the falling water levels and the possible impact this would have on the quality of the fishing out on Kentucky Lake. Whatever doubt there may have been was put to rest early and often today when anglers began flooding the weigh-in tanks with solid fish. Tomorrow, conditions are set to be a little different than today as the chance for rain increases. This is something to keep an eye on heading into the morning. We will be at it again bright and early tomorrow with the live blog starting at check in, and all of our social media platforms will carry various content throughout the day. 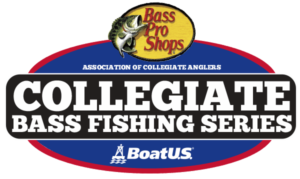 Thank you for an awesome tournament and all your hard work to make this happen for our college anglers . Let’s go Bryan College ! Cole Sands and Nathan Bell let’s go find those big ones today !